Tomatoville® Gardening Forums Index > We're Here For The Tomatoes!™ > Undercover Gardening™ > Snap & Grow? Looking at the 6x8 snap & grow greenhouse. Looks pretty easy to put together. We have used a small greenhouse before to extend our season both ways. Has anyone had any experience with these? We are in Southern Indiana, snow load is not a big issue, and our wind is limited due to our location. I guess we will see how it goes, today we ordered our green house. Should arrive around the first of Feb. I would love to find a planting guild on when to start what in the greenhouse to be ready for spring in my area. Good luck and enjoy your new greenhouse! A wonderful hobby it is. Takes practice in your own greenhouse incyour own yard and microclimate because no two are alike. Some trial and maybe some error will have you growing beautiful seedlings in the protection and great light only a greenhouse gives in the early season. I recommend buying one of those remote weather station things available for about 25$. Use it to monitor temp and humidity in your greenhouse by hanging the sensor in a shaded spot in the greenhouse nitbtouching exterior walls. Then you can see the temp in your greenhouse while you remain in the house. A small ceramic heater works wonders to keep the interior above freezing in a late cold snap. I just bought the tiny 4x6 Palram Nature Hybrid, but I was looking at other larger Palram Greenhouses for months including the Snap & Grow. All of their Greenhouses receive the equal amount of positive praise and negative reviews so I am sure you will either love it or hate. Most of the negatives that I saw was regarding assembly and missing parts, but I also saw that Palram customer service will take good care of you there. There were a few complaints about leaks, but that's what caulk is for. I have enough window space in my house and sunroom for starting plants, but to extend the season on some of my tomato and pepper plants requires a Greenhouse. Looking forward to exploring the uses of the extra grow space - I bet you are excited too! 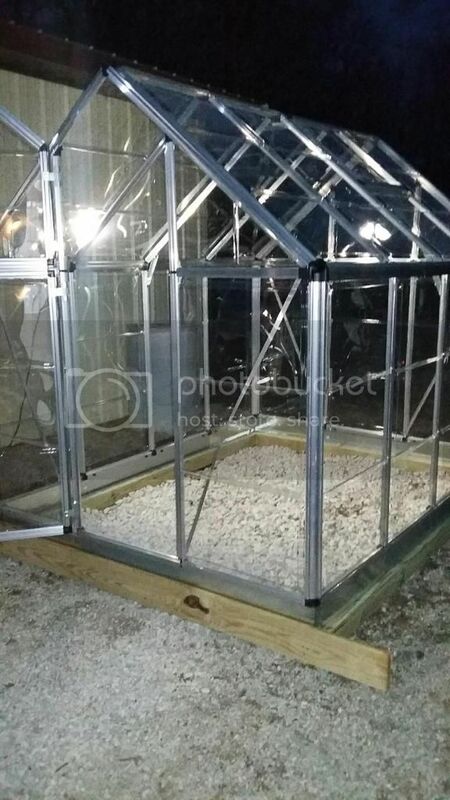 My logic for my choice for going so small is that it's my first Greenhouse so I want to try it out to see the benefits/advantages on a small scale and secondly that I really want to move in the next 3-5 years and with a 4x6 built on a wood base I could either move it with me or easily sell and transport it in a pickup. I was looking at 8x12s and larger, but I certainly would not want something that I had to disassemble, then reassemble if I moved. I have some bolt on jack-wheels that I could mount to the wood base and even put this little guy in the back of my garage or under my 2nd story deck during the harsh Winter until ready for use in the early Spring. We just had 45-50 mph winds with heavy ice yesterday and I don't think many cheap Greenhouses could stand up to that without some minor repair afterward, so being able to bring it under cover is a good option too. We also get the occasional dump of 2-3 feet of snow and back-to-back storms to boot. I figure for $339 delivered, it's not much to lose to give it a try. It will be here tomorrow, but it will sit in the box until at least March (after I check if the parts are all there) before I assemble it. Last edited by rhines81; January 24, 2017 at 09:15 PM. We spent some time in the seed catalogs last night! Getting excited. I have had two 6x6 greenhouses in the past. They are the $99 ones from HF, the plastic cover gives up the ghost after one season. We wanted something that might last longer. The location I will use limits the direct wind on it. I never had any issues with the other two blowing away. I start my plants in a small unit indoors. It is much easier to keep the heat needed for germination. Only after the plants are well established will I take them out to the new green house. Last time around I got a little excited and started too early. I had tomatoes in June, but I had a lot of big plants with no place to go! This year I will plan my timing better. Our goals are to get an early jump on the season. And try and pick a ripe tomato after Thanksgiving. Would also like to grow greens year round. I'll try and post a couple pictures after we get it up and running. Finally got it together and out of the garage! Hope to start seeds this weekend. Will start in the house and move to the green house after a couple of weeks. Weather here in Indiana has been very harm for this time of year, easy to get ahead of myself. Kit was complete, instructions where pretty clear, they are all illustrations, almost zero text. But they are direct and pretty easy to follow. I would guess about eight hours build time. Had help at least seven of it. We put it together in the garage where the floor is flat and level. If you had to install in place, it might have been harder to keep square and level. I put the foundation together then carried the greenhouse out and sit it on top of it. Took two of us to carry it out and sit it in place. Last thing you install is the door and inside braces, finished just at dark. I can post some more pictures after things are up and running if anyone is interested. The location blocks all our big wind from the north and west. Its easy to add a couple of straps over it, I expect that I will. It is more solid than I expected. Would I buy it again? I'll let you know in a couple months. I have three pots of Tom Thumb peas growing well in the greenhouse. They have responded well to the trip from inside the house to the greenhouse. My germination has not been very good as yet. I have only had five tomatoes sprout so far. But I have not added any heat to the set-up, the trays where just out on our kitchen counter. I have moved them to the bathroom with a little extra heat to see what happens. So far I have been able to keep the greenhouse heat where I want it it overnight with a small electric heater, on low. We had overnight temps in the upper 20's and it did fine. We have warm days in the forecast this week and snow for the week end! I'll take more pics when there is something to see. Hi, any updates on the greenhouse? I decided I want a small greenhouse. I start my tomatoes in the basement under lights. Once I pot up my tomatoes, they go out on the patio during the day and inside at night. I carry them in and out on trays. Every year, we get days that are just a little too cold and very hard rains, that would wash the potting mix out if I didn't put them under the overhang of the house. If I had a small greenhouse, seedlings could go in there to get sun and protected from the hard rains. I would also like to grow my salad greens longer, if not year round. Maybe some carrots too. Maybe put a tomato in a pot and see how long it would go into the fall. I think it would be fun. I've been looking at the palram 6x8' greenhouses. Would like to hear more about how it's going with yours. Sorry for not updating sooner. The greenhouse has done great. One year under our belt with really no issues. We are still very glad we bought it. Getting ready to start a new crop! Glad it worked out for you! Did you get the season extension that you were looking for? Do you think it would stand up to the wind and snow as described above? I have all that and huge hail too. Thanks for replying. Use this link for instructions on how to post an image on tville. You don't need photobucket. Just post your image to tville directly. Last edited by jhp; January 24, 2018 at 07:59 AM. We did pick ripe cherry tomatoes and peppers in December. I turned the heat off before Christmas, but we still get green onion tops even when unheated. Going to start some spring greens soon. It has taken all the weather this year without issue. We have had some hard winds and rain and just got rid of a six in snow fall that hung on for a week. My door faces the weather, but even so it has held up fine. Not happy with all our plant choices. I need to look closer at container friendly this year.